What Exactly Can Knapping Tell Us? Alaina Wilson, the speaker in the Villard room, talked about the similarities of Native American stoned tools from New York and Alaska. She compared different stoned tools and analyzed their use for the different regions. What really surprised me was that she never mentioned if the tools were made by indirect or direct percussion methods. In my opinion, this information would have been useful in determining what type of culture the knappers lived in. What also surprised me was the fact that the speaker only talked about technological similarities of the two societies. 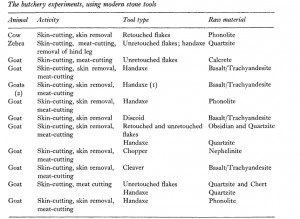 In Pierre M. Desrosiers’s book, The Emergence of Pressure Blade Making: From Origin to Modern Experimentation, it’s evident that knapping techniques reveal information about preexisting cultures in Central Asia. Specifically, pressure knapping was present in Central Asia during the beginning of the Holocene. Desrosiers notes that depending on the culture, tools were either made using a short crutch or a long crutch. According to Desrosiers, Central Asian civilizations adopted the technique through cultural contact with the Far East and from migration of bearers of the technique from Siberia, Mongolia, Xinjiang. From this information, different methods of knapping can describe the influencing factors of cultures and can demonstrate how cultures evolve through technological advances. 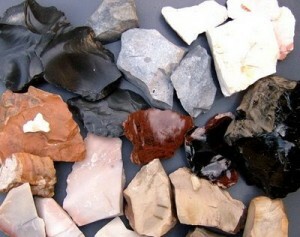 Thus I believe that knapping techniques can always describe technological and cultural traits of a society. What I did learn from Alaina was that shock waves are sent through the stone during the process of knapping. Furthermore, Professor Lucy Johnson flint-knapping demonstration in class helped me visualize how flakes are produced. I noticed when the angle of contact was just slightly off, her stone would not form the way she wanted it to. Professor Johnson also enlightened the class that flake debris can help archaeologists reenact the knapping done and can indicate what type of tool was being made. 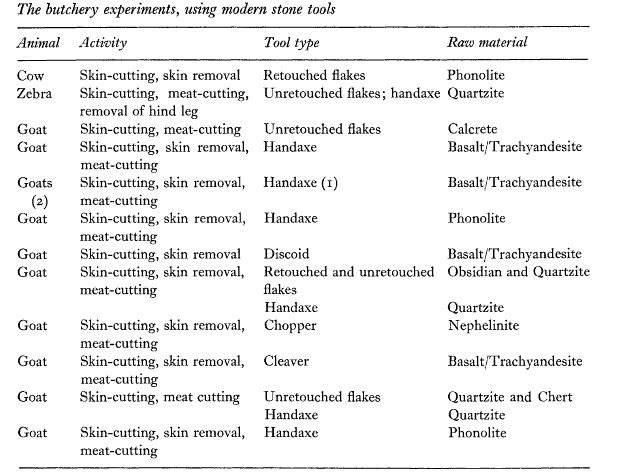 The analyzing of flake debris helped the archaeologist in the study compare the types of tools that were produced. After watching Professor Johnson knap and listening to Alaina, I was curious about the concept of flake debris sizes created from flint-knapping. I found out that there’s a relationship between the weight of crafted tools and the flake debris generated from knapping. According to archaeologist Michael Shott, flake debris can help determine original tool weight and can show the depletion of the original tool. In all, Alaina Wilson’s hypothesis was proven by the discovery of similar weight distribution of the flakes from both sites, the fact that the stones went through feather termination, and the artifacts from both of the sites showed similarities in the late stages of the knapping process. Experimental archaeology is a field of study that attempts to generate and test archaeological hypotheses, usually by replicating or approximating the feasibility of ancient cultures performing various tasks or feats. When focusing on tool making, archaeologists will often recreate these tools to the best of their ability in the hope of learning the answers to questions such as why or how these tools were used. The imitation of flint knapping can lead archaeologists to answers about the difference in tool making and usage of tools from different time periods and/or locations. This past summer Professor Lucy Johnson and three Vassar students produced a comparative analysis of tool making debris from Native American sites in New York to a site located on Unga Island in Alaska. Specifically, their research was angled toward the determination of whether or not different cultures produce different tool-making debris or if the debris is constant despite the location of the tool making. It was determined that in the New York State sites, the Native American knappers were approaching how they were going to knap in similar matters based on the consistent finds among all sites. Additionally, the weight distribution, striking platform, and limited dorsal cortex of the debris were coherent between both the New York and Alaska site. Based on this evidence, it can be determined that sites that reflect similar stages in the knapping process show similar trends in flake attributes. 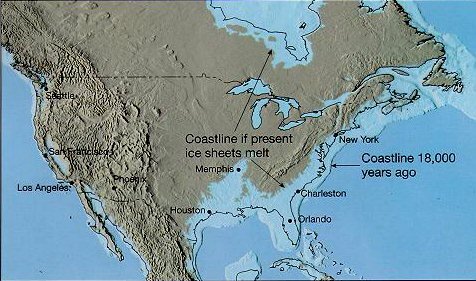 The distinguishing factor between these two sites would be the use of brittle volcanic stones in Alaska and chert in New York State. While the process remains the same despite the material utilized, the volcanic stones are harder to control and probably led to a more time-consuming knapping process. Peter Jones and his experimental butchery with modern stone tools exhibits another usage of experimental archaeology. Within his study, Jones looks at the efficiency of various stone tools such as large hand axes, cleavers, retouched flakes, etc. His overall objective was to determine which of these tools worked better in the cleaving and skinning of numerous animals of different sizes (goats, zebras, etc.) and to rationalize what this may have meant for hunters and knappers in the early Paleolithic and Pleistocene. His overall conclusion inferred that large, generally bifacially flaked tools are more efficient than small plain flakes for most butchery tasks. Large tools would be advantageous due to their weight and long cutting edges. However, at predominant Paleolithic Sites there has been an abundance of small flakes and flake tools discovered. In Jones’ opinion, these are the result of tool re-sharpening and/or reworking. In my opinion, experimental archaeology is one of the few methods that can effectively aid in the understanding of previous stone tool assemblage and usage…most of the time. I remain cautious due to the fact that although our methods may be succinct, we can never be sure because we didn’t coexist with these people. History and archaeology are not about finding the “right answer.” They exist to build a logical story of events that may or may not be true due to what we know. Newcomer, M., & Sieveking, G. (1980). Experimental Flake Scatter-Patterns: A New Interpretative Technique. Journal of Field Archaeology, 345-352. Retrieved October 4, 2014. Marzke, M., & Shackley, M. (n.d.). Hominid Hand Use In The Pliocene And Pleistocene: Evidence From Experimental Archaeology And Comparative Morphology. Journal of Human Evolution, 439-460. Retrieved October 4, 2014. How far will human denial go? Shored Up identifies the increasing crises of global climate change and sea level rise, and the equal threat of our society’s inability to recognize and react appropriately to such crises. People are attracted to water, so coastlines have become a prime source for development. Time and time again, as disasters strike coasts and nearly wash them clean, people run back to rebuild their homes. An example the documentary mentions is Long Beach Island, New Jersey. Long Island is extremely vulnerable to storms of any degree and each year New Jersey loses a half-foot of shoreline due to erosion alone. In 1962, the island received its first major catastrophe when the “100 year storm” hit. Once it passed over, people came back in, started constructing new homes, and implemented beach replenishment and nourishment programs. These programs are extremely expensive, short term attempts to elongate the coast, shedding light on the human denial of the power of nature and of climate change. So, how does this relate to archaeology? Shored Up didn’t explicitly reveal any connections between climate change and archaeology, although it hinted at one. 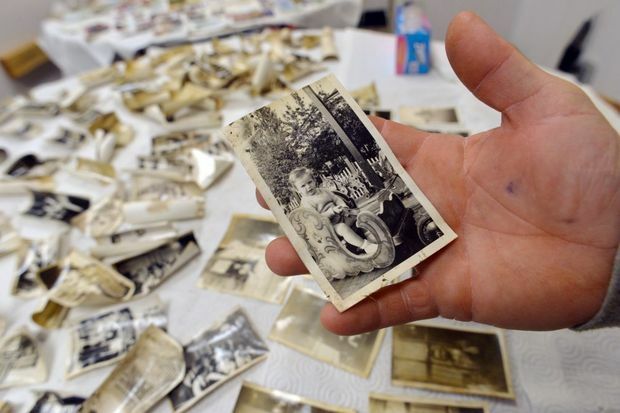 Footage took us into the personal accounts of families whose homes were destroyed and we watched them sift through rubble to find any significant remains. This in itself is a subtle form of archaeology, in which the victims are forced to sort through the matrix of debris to find any remaining valuables. As a response to such natural disasters, the field of disaster archaeology has recently emerged, which incorporates archaeological practices into recording and recovering evidence, including human remains, victim identification, disaster scene analysis, etc., from mass fatality disasters. The major connection between climate and archaeology is that fluctuations in climate can tell archaeologists many things about the environment and culture of a location. The climate and environment govern human life, so when changes in climate occur, changes in culture occur. A perfect example that dictates this relationship is the Ice Age. During the Ice Age, glacial ace covered the majority of water and land, allowing only mostly megafauna and microorganisms to exist. When humans moved into North America and came into contact with such megafauna, they had to create large weapons to take down these monstrous animals for survival. Around 10,000 years ago, the ice began to melt, causing the megafauna to go extinct, which brought the shift to archaic culture. Archaic culture shifted towards smaller game and agriculture, and technology therefore changed to smaller tools to accommodate this shift. This example shows how culture is dependent on climate. Archaeology can reveal how humans have either adapted to or denied the nature and climate of their environment. Like the humans of the Ice Age, we need to adapt to the circumstances of today. Shored Up encourages us to accept, not deny, climate change and the powerful force of nature, so that we can start coming up with and implementing long term, sustainable solutions to climate change and coastal disasters. Renfrew, Colin, and Paul G. Bahn. Archaeology Essentials: Theories, Methods, and Practice. New York, NY: Thames & Hudson, 2010. 202-03. Print. Pg 173. How Do the Walls Around the World Function Differently? hwu on How Do the Walls Around the World Function Differently?